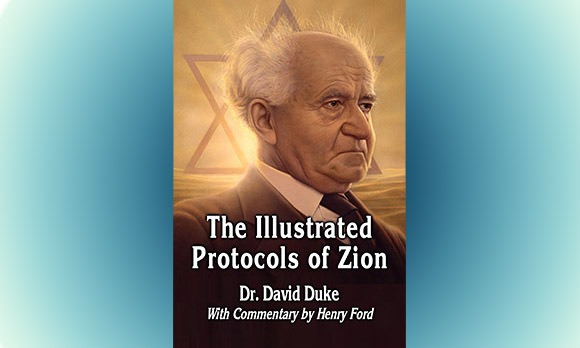 New Duke Video: The Illustrated Protocols of Zion–Help us Publish this Incredible New Book! By Dr. David Duke. The Illustrated Protocols of Zion will probably make more impact than any previous book that I have ever written. The original Protocols of Zion have been read by countless millions of people over the last 117 years. It is still the most common Internet search item when it comes to the Jewish Question. This book takes the basic assertions of the protocols and proves them in the present time. It is a brand new edition of the classic work which takes the “old” Protocols of Zion and shows, using present-day practical examples, its prescience and astonishing accuracy—despite being more than century old! Almost everybody knows of the “original” Protocols of Zion—and their historical background. They were probably complied by Czarist agents towards the end of the nineteenth century as a weapon in their war against the large-scale Jewish Communist uprising which they faced. The Protocols have been derided as a forgery, slander, and lies—yet remain one of the most widely read books in the world on the Jewish Question. In my new book, I show that it is actually irrelevant if the original Protocols were written by Czarist agents or not. In fact, as I point out, they are in reality a highly predictive work of “fiction”—much like George Orwell’s 1984, or Aldous Huxley’s Brave New World. Although the characters and storyline in both those works are “fiction”, the idea which underlay both those books was most certainly fact. Thus, they were works of “fiction”—just like the Protocols of Zion. The original Protocols claims that the Jewish extremists control the press. The Illustrated Protocols proves this with Jewish headlines and illustrations. The original Protocols claims that Jewish extremists control major governments. The Illustrated Protocols proves this with illustrations, examples and quotes from leading Jewish Supremacists themselves. The original Protocols talked about Jewish dictatorship through a tyrannical world government. The Illustrated Protocols quotes the most famous Jew of the 2oth Century, David Ben-Gurion, where he states his vision that the Jews will be worshiped in their world headquarters in Jerusalem, and that Israel will possess the Supreme Court of mankind. Truth is stranger than fiction! Whereas the original Protocols could certainly make one think, the Illustrated Protocols of Zion will leave no doubts. Whoever wrote the original Protocols possessed a remarkable insight into how Jewish Supremacists operated—and because it contains that remarkable predictive power, it remains a resource study for anyone wishing to gain an understanding of the psychology of Jewish Supremacism. My new book is not, however, “just” the “old” Protocols. In it, I show that the reality of present-day Jewish Supremacism—in terms of media control, financial manipulation, control of governments and outright Jewish racism—were all accurately predicted and mapped out in the Protocols. This is without question one of the most important books ever written on Jewish Supremacism, and is guaranteed to be another work which will go down in the annals of history as an earth-shaking opinion changer. I need your help to get this book out to as many people as possible. We will not print that many in the first run, but it will take an adequate number of books printed to allow the book to be published at an affordable cost. We will also send the book to key people around the world, who in turn can share this book’s truth with millions more people. To do all this will require your generous support. The book will be published as a substantial, beautifully printed hardback complete with a full-color glossy jacket. It will be of worthy quality to refer to for years and to pass on to your children. Those who make a gift of 100 ($ or € in Europe and the Middle East) or more, will receive a numbered, autographed and authenticated edition of the very first books published. Because of the amount of money needed to finance this book, if you can, please consider making a larger gift if at all possible. If you can contribute 200, or 500 or even a 1000, such a gift will enable us to print more books at a lower cost and allow the distribution to those who absolutely need to read this book. Please used the form below to make a substantial gift. Any gifts made of 100 $ or € or more will be rushed the book the day that they come from the printer. We expect this to be within the next 30 to 60 days. Please be patient: books will be sent out as soon as they arrive from the printer!